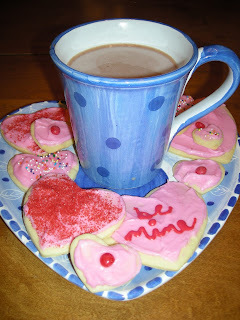 For me, these cookies are so very Valentine's Day. Val made these every year for classroom parties and always, a batch to have at home, too. I was allowed to bring them into school in her special square Tupperware container as long as I promised to, "Bring it home!" I remember struggling up the bus steps in my winter coat, snow pants and boots, trying to carry that container so carefully, as not to jiggle and break the cookies inside and resting it on my lap during the seemingly endless bus ride from East Falmouth to Mullen Hall School located in the center of town. My valentines, neatly labeled for each of my fourth grade classmates (even the boys, yuck!) safely tucked into my book bag at my feet. The Snoopy ones with the perforated edges and the matching envelopes that I begged Val to buy for me instead of having to give out our usual construction paper and doily creations. (None of the cool kids made homemade Valentines in 1979!) Looking back, I wonder how my 9 year old self managed to safely deliver those cookies, the star of the class Valentine's celebration. Memories alone are not enough to make a recipe stand the test of time. But these cookies are so good, I make them without fail at least two times a year: for Christmas and Valentines Day. (I would make them more often but they are a bit time consuming and I have already admitted in the past to being incredibly lazy.) The frosting to cookie ratio is just right. The fond memories are intact. And really, who can resist a sugary, heart shaped confection decorated with sprinkles and/or red hots? I know I can't. Combine flour, baking powder and salt in a bowl and set aside. Using a stand mixer, beat butter and sugar well. Add eggs and vanilla and mix until light and fluffy. Add flour mixture and blend until smooth. Wrap dough in plastic and refrigerate for one hour. Combine butter and 1/2 cup sugar using a stand mixer. Mixing well after each addition, slowly, add 1-2 teaspoons milk alternating with remaining sugar until all sugar is combined with butter and frosting is at desired consistency. Frosting should not be runny or thick, but in between. Adjust with more milk or sugar, as necessary. Add a few drops of red food coloring, if desired. Frost cookies and add sprinkles as you go before the frosting hardens. Let cookies sit overnight before packaging so that frosting is firm. Store cookies in airtight containers with wax paper between each layer.